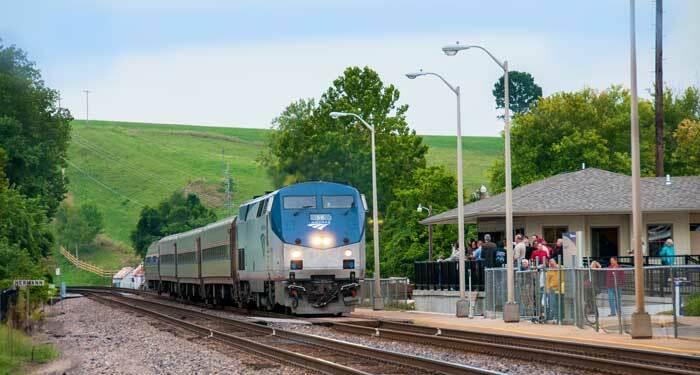 Amtrak’s Missouri River Runner line, which runs between St. Louis and Kansas City, makes four daily stops in Hermann. Hermann’s new train station is on the riverfront, just behind the Festhalle and red caboose. Missouri River Runner #311 — 10:49 a.m.
Leaves St. Louis at 9:15 a.m. Arrives in Hermann at 10:49 a.m. Arrives in Kansas City at 2:55 p.m.
Missouri River Runner #313 — 5:34 p.m.
Leaves St. Louis at 4:00 p.m. Arrives in Hermann at 5:34 p.m. Arrives in Kansas City at 9:40 p.m.
Missouri River Runner #314 — 12:03 p.m.
Leaves Kansas City at 8:15 a.m. Arrives in Hermann at 12:03 p.m. Arrives in St. Louis at 1:55 p.m.
Missouri River Runner #316 — 7:48 p.m.
Leaves Kansas City at 4:00 p.m. 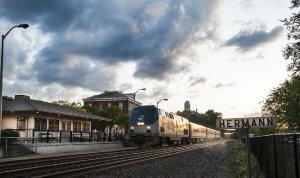 Arrives in Hermann at 7:48 p.m. Arrives in St. Louis at 9:40 p.m.